The Nigerian oil group Oando plc is locked in a bitter struggle with RoyalDutch/Shell over oil fields in the Ogoni region which the latter abandoned in the mid 1990s in the aftermath of the execution of Ogoni leader, and environmental activist, Ken Saro Wiwa. Playing the nationalist card, Huhuonline.com has learnt from industry sources that Oando is counting on its local roots and knowledge of the terrain and traditional practices in the Niger Delta region to appear as the natural candidate to recover licenses that Shell and other western oil companies will never be able to develop because of conflicts with local inhabitants. Huhuonline.com checks reveal that Oando intends to outsource development of the Shell oil rigs to Agip. Industry sources also told Huhuonline.com that Oando has already concluded a two-year deal with Agip worth $150 million under which Oando will put two oil rigs at the disposal of Agip's affiliate in Nigeria. At stake are Oil blocks OML 11, 12 and 13 which were withdrawn from Shell in 2007 by the Obasanjo government which accused Shell of neglecting to develop them. But Shell is not going down without a fight. The company has lodged a protest and has been pressing the Nigerian government to let it retrieve the acreage in return for a guarantee that it won't have any more trouble with the Ogoni community. Following the execution of Ken Saro Wiwa in 1995, relations between Shells and the Ogoni community have been particularly feisty and strained, preventing the group from operating in the region. Indeed, RoyalDutch/Shell has been subpoena to appear in a New York court in the United States on charges of complicity in the execution of Ken Saro Wiwa and the other Ogoni-9 militants. The Nigerian government awarded Shell's old acreage to the Nigerian Petroleum Development Company (NPDC), the exploration arm of the Nigerian National Petroleum Corporation (NNPC) but no work has yet been done on it. Engaged in a protracted legal fracas with Nigeria ever since the acreage was withdrawn, Shell wants to return to Ogoniland and put the fields into production – but presidential sources told Huhuonline.com that President Yar'adua is wary over the renewed presence of Shell, which it is feared, would inflame an already volatile toxic political landmine and undermine efforts to end the militancy in the Niger Delta region. 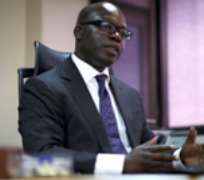 Oando's General Manager, Wale Tinubu, according to sources, received a go-ahead from the company's stakeholders in August to raise $1.3 billion to press ahead with its projects over the coming two years. One of these is to accelerate construction of an oil complex including a giant refinery in the Lekki free trade zone in Lagos. Although the current credit crisis and a freeze on big refinery projects makes it highly doubtful that a complex of such size, which would cost billions of dollars, is feasible for the moment, Tinubu is determined to see that the project for a refinery to treat 350,000 bpd alongside the oil terminal see the light of day as soon as possible. Oando already carried out a pre-feasibility study on the project in 2007. Oando's campaign against Shell comes hard on the heels of a Nigerian High Court ruling that the Yar'adua government illegally revoked exploration licenses granted to a South Korean oil consortium. In a case watched closely by foreign investors concerned about the security of contracts when governments change, the Korea National Oil Corporation (KNOC) had filed an action demanding the restoration of two offshore licenses, granted in 2005. Former President Olusegun Obasanjo had awarded KNOC rights to the two oil blocks, which some estimates suggest could hold as much as one billion barrels. In return for the exploration rights, South Korea paid $9m in cash and offered a letter of credit to pay another $231m, in order to cover its 60% interest in oil blocks OPL321 and OPL323, which are based in deep water in the Gulf of Guinea. The South Koreans had also planned to build a 1,200-km (745-mile) gas pipeline from the southern delta to the capital, Abuja, and provide 2,250 megawatts of power generation. Nigeria revoked the licenses - which were later awarded to an Indian firm - in January, alleging that the consortium failed to make agreed payments. But the court said that President Umaru Yar'adua did not have such power. The government has said it will appeal the court's ruling.